So introducing . . .
We like to always have a couple stripes available, and this one would look great with all 3 strap colors, especially natural and brown! We had several animal prints to choose from but went with Zebra because we have never done it before and thought it would rock on a Kozy bodh with natural or brown! Another earth toned print to replace our popular stony creek. I have offered camo's from the very beginning, not just because Charlie likes them (I have an old camo I wore almost daily 6 yrs ago) but I just like the option as something less feminine and 'trendy'. I feel like we can't be without one but we like to mix up the colors. We have never done one mostly green before so this one was perfect to go with any color canvas. Another added bonus is that we have some of our pink ribbon straps/bodies left over from our limited Breast Cancer Awareness Kozy! They have the ribbon embroidered on the strap and for a limited time you can pair them with any print on the site (well as long as it will go with pink). Hmmm, I am thinking Hideaway Cove w/ pink straps? The perks for me are that I 'can' have any Kozy I want!! The hard thing is NOT having a Kozy made for myself out of every print. Right now my Pulaski on brown Kozy is getting the most use around here. 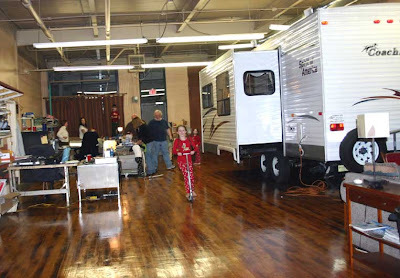 But I am really digging the Quantico and Dundee as I am previewing this post, LOL!! I have had a few people ask me how to do these so I figured since I have done like 7 of them I'd put up a tutorial. Well OK, so I have only really done 1 (for a friend). Charlie (my hubby) technically did the other 6 (2 with my first pregnancy and one with each of the other 4). I am so, so glad we had the forethought and took the time to make these with each pregnancy. I think they are just beautiful and what a wonderful memento of your pregnant form! Mine are still raw and unfinished as you can see in the pictures, but some day I will trim the edges and paint them. I don't have any pictures of the casting process, because there was never anyone around to take them (and we usually have very messy hands). For those of you who have never heard of belly casting before . 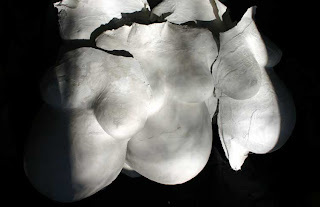 . . as you can see in the pictures, a belly cast is a cast of your pregnant form. It is usually done with plaster gauze strips. You can buy them in craft stores like Michaels or Hobby Lobby or online. One name brand is Rigid Wrap (the brand I have always used). I have heard of some people who used actual cast (like the medical stuff you use if you break your arm). 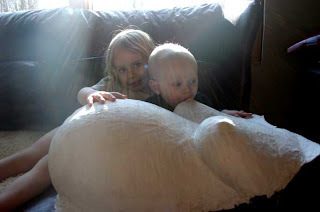 and you can make your own apparently by using fabric and plaster of paris (never done it so I won't give directions how) but it is just easier to buy the plaster strips premade for casting. There are also commercial kits available online (google search for them) but they tend to be expensive and you can gather the supplies yourself and save some money. You can do it yourself for usually under $20. 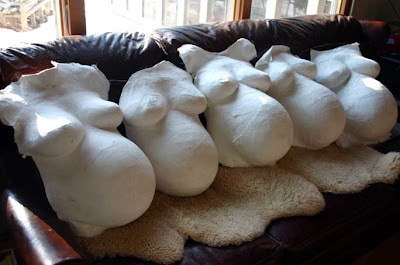 Some people even offer the service of belly casting (I actually considered it before starting Kozy) and will come to your home and do it for you. 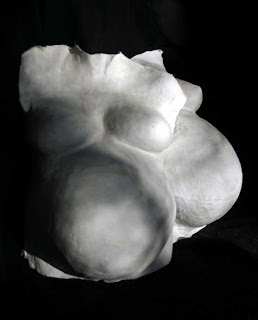 I think a belly cast is an amazing work of art! You are only pregnant with each individual child once. When you are pregnant your body takes on that unique shape, the shape of creating and growing life. It is a precious time and many people want to remember what they looked like in a 3D form. It can also be a memorable keepsake. I take pictures of my babies in their cast after they are born, and I put their footprints inside where they used to kick me the most. It is something I will cherish forever. You can paint them, and mount them as a work of art, or you can keep them raw and keep them tucked away for only yourself and your kids to enjoy. Either way, everyone I have ever talked to has always been really glad that they made one. When do you want to do your cast? I like the biggest belly possible, so with all of mine I wait as long as possible. With Xian I did it at 38 and 40 wks. With the others I as either in early labor (I even woke Charlie up at 3am to do the cast since I was in labor) or after my EDD. However, I usually have very long labors and they slowly build, so I can wait. If you have fast labors (or haven't been in labor before) or have ANY concern about going into labor before you are able to do your cast, you may want to play it safe and shoot for 38 wks. (or earlier if you have early labors) You can always buy more material and do one around 40 if you make it that far (there can be a pretty good belly difference in 38 and 40 wks). If you don't mind not having the biggest belly possible then anytime after 36 wks would probably work great! How do you want your cast to look? You can do just the belly or the breasts and belly. Some will stop just above the breasts and under the belly, but others will go all the way up to the neck and down to include part of the thighs. Remember that you can trim and shape your cast afterwords (so far I have only done that with 1 of mine. . . Pipers in the picture at top, 2nd to the left) But I plan to do it with them all eventually. You can also include your arms/hands in the cast.. If you want to have your hand on your belly you would include your arm in the cast. If you have someone else helping you (besides your husband, who has always done mine) then maybe your husband would want to include his hand while someone else casts your belly. I did one when pg with Xian with Charlies hand on my belly . . . which was difficult since it was just the 2 of us there The variations are endless! You can see pictures of various ideas for casts HERE. What position do you want to be in? Standing produces, IMO, the best looking cast, but standing for that length of time (20 minutes minimum) unable to move is often very hard when you are very pregnant (believe me, I know, I did it in early labor with like 3 of them, LOL!!). Lying down would be most comfy but it really distorts the belly and breasts. Sitting would work but realize that will distort it too and may make casting the lower belly hard. I think ideally, if you can find a tall stool that you can prop yourself on that would work best. I usually just lean up against the wall. You will want to make sure you feel good, have eaten, are not tired etc so you will have energy to stand there. With Piper I thought I was going to pass out, but with the other 4, I did fine. Plaster gauze strips. You can buy these at craft stores like Michaels or Hobby Lobby, one name is Rigid wrap but there are other brand names as well. 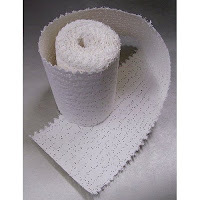 If you do a google search for "plaster gauze strips" you will find many places online that sell them. Most come in rolls of 4" x 5 yds. In that size, you will want 3-4 rolls. If you are average size and want to do neck down to bottom of your belly then 3 rolls should work (that is what I use). If you are larger and want to also do arms, or start higher and end lower then go with 4 rolls (or more). If you are just doing the belly and no breasts, then 2 rolls would probably work. If you can find 8" rolls then buy at least 1 of those, it makes things go really fast and replaces 2 4" rolls. You will cut the strips into 12" and 18" sections. I usually cut a few smaller ones around 6" too, for around the breasts. It is pretty easy to rip the longer pieces in 1/2 if needed while casting. Lubricant. You need to completely coat your skin so that the plaster won't stick to you. It will stick to any hair and hurts when it is pulled off so grease up as much as possible!! Most people recommend Petroleum Jelly, but, no thank you . . . I won't put that stuff on my skin!! I like to use Olive Oil, I use it very generously and it is good for my skin. I have heard of people using crisco too. Drop cloth. Or a shower curtain, newspapers, tablecloth etc. You need something to cover the floor, chair etc. where you will be casting, because it can get messy. Shallow Pan of Warm Water. This is for wetting your gauze strips. We use some type of baking dish usually. Something that is wider makes dunking easier. Plastic wrap or something similar. Like I said above, the plaster sticks to hair terribly. You can grease up enough to keep it from pulling hair on your body, but if you are doing a full belly you will be getting low enough to cover some of the hair . . . ummm . . . 'down there' if you know what I mean, LOL!! So I cover it with some plastic wrap before putting the plaster over it just in that area. Casting can get pretty messy so you will want to choose a spot in the house that is easy to clean. I usually use the kitchen or at least do it on a hard floor. The kitchen is ideal because the counter and sink are right there and that makes for easy clean up and access to your stuff. Keep in mind again, that this is messy so whoever is doing the casting may want to wear old clothes (though the plaster washes out nicely) and since it drips, we are usually barefoot. I usually strip down to my undies. Generously coat your body in olive oil. Do not be afraid to use a lot, the plaster WILL stick to the hairs on your body so grease up well!! If you need to use syran wrap over your privates it should stick to the oil. While you are doing this your helper can fill a wide, shallow bowl/dish with warm water (as per the instructions on your plaster strips). Make sure you have your strips cut to the proper lengths mentioned above. I lie them in stacks according to length so that Charlie can grab what he needs easily. All of the materials should be located as close to you as possible, to cut down on the mess and make the process quicker. Find a comfy spot and position (as mentioned above). Pregnant breasts are usually saggy so to make casting them easier make sure to hold your shoulders back to give them as much lift as posible. If needed you can tape them up (I have never felt the need to do that). I would not try to lift them to cast under them though, it won't look as good and will probably make the cast harder to remove . . . just have your helper do the best they can and stop where they meet your body. Take a minute to plan out how you want to proceed. Make ALL your decisions (position, how much of the body to cover) before hand. Charlie usually takes a minute to plan out how he wants to arrange the strips and where he wants to start. Start casting. Once you place the first strip on the body you will need to work very quickly as it dries very fast. The strips can get folded when dipped, which is why a wide dish is easier to use. Charlie dips, removes the excess water by lightly running 2 fingers down the strip, then places it on. He usually starts around the breasts, since it is a bit more time consuming, then works on the belly. Don't forget to work all the way around the belly to the sides of your body (which show just how large the belly is). He covers the whole body with 1 layer, then does a 2nd layer going in the opposite direction. Ideally you want to smoothe the plaster in after you put the strips on. I will help him out by rubbing it in and smoothing the strips together while he places more strips on (he is not a super fast mover, he is more detailed oriented, LOL, so this saves time). Of course there comes a point where I can no longer move to do this. You will need to though, for the most part, stay very still during the casting process. After a few minutes you will start to feel the cast separate from your body, just hold still though till your helper is finished with the entire thing. If for some reason some areas don't get a good couple layers of plaster on them, that is OK, you can go back later and reinforce it. Once the cast is finished you don't want to remove it until it has all hardened enough to start separating from your body. For me, that usually happens pretty quickly. I don't pull the cast off of me, I simply hold it and contract my skin and it pulls away from the cast. Be prepared for the possibility that it may be uncomfortable, especially if you didn't grease up enough or missed some spots. It is OK though, it just lasts a second. After removing the cast I usually leave it to dry for a day or 2. I like to ball up a couple of towels and fill the belly area with them and kind of prop it on it's side to dry. The towels help it to keep it's shape so that it doesn't get distorted looking as it dries. The edges are usually pretty delecate so I don't want to put too much pressure on them. 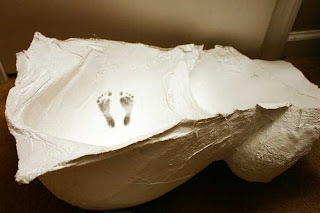 Put baby's name, birthdate, footprints inside - I like to put baby's foot prints inside the cast in the place where I typically got kicked the most, and if you can get them to cooperate, you can do handprints as well. 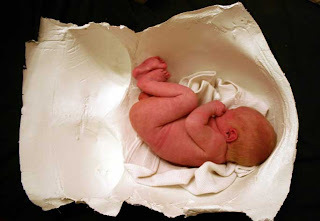 Take Pictures - After baby is born, it is really cool to take a picture of them inside the cast. 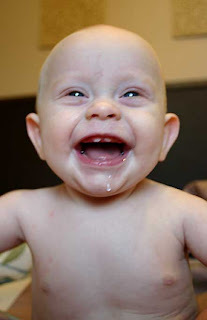 You look at baby and then look at the cast and think . . . there is no way they will fit inside there . . . but they always do!! It is VERY cool. I like to put a white blanket inside (so it blends in with the white cast) and then strip them down and ball them up and place them head down like they would have been in the womb. Fortunately, newborns sleep so much that they usually cooperate for the pictures. Reinforce and trim - You may choose to keep your cast raw, which is fine, but if you do you may want to at least 'tidy' it up a bit. If it is thinning in some areas you can add more plaster gauze strips to the INSIDE to make it stronger. You may also want to trim the rough edges. You can just trim them to make them smoother or you can trim and angle the edges to make it more artistic looking. Sand and Smooth - You can sand the cast to make it smoother. After sanding if you apply a few coats of Gesso (which is like art primer) and sand again and you should get it pretty smooth look. If you want it even smoother you can apply a thin layer of joint compound over the whole thing (you can also use it to cover any imperfections, like folded strips etc.) and sand it after it dries. I have used plaster of paris but that will chip off if the cast moves at all. When I get around to finishing mine, I will do a layer of joint compound, then I will sand it, and when it is as smooth as I want it, I will then apply the primer (gesso) and then paint. Display your cast - You can hang it on the wall by punching holes in the top corners and threading a ribbon through. If you don't want the ribbon showing then you can drill holes lower and use wire or ribbon (kind of like a wire picture frame hanger). You can also mount it inside a frame. Many people like to hang them in their baby's room (if they have one) or do what I have done so far . . . just prop it up on a table, or shelf. Decorate Your Cast - there are ENDLESS ways you can decorate your belly cast. 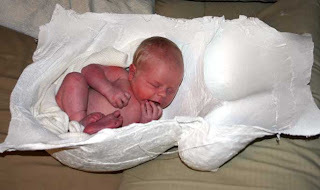 Paint your cast - You can paint over a smooth cast or keep it rough to add to the 'texture' (but make sure you prime it first) You can paint your cast to match your nursery, your baby's birthdate month or astrological sign. You can wait till your baby grows and pick a theme that matches their personality. You can let them help you paint it. I have even heard of people dehydratig the placenta and mixing it with paints. You can paint a picture, a design, their name, or you can do a solid color to look like metal or stone. After painting you can do a clear coat over top to protect it. You can choose to make it matte or glossy. Decoupage - if you want to decorate the cast but don't want to go to the trouble of smoothing everything out first, then just grab some Modge Podge and do a decoupage (you may need to prime it first though). You can decoupage it with xeroxed pictures of your baby (I did that for my sisters cast). You can cut out pictures, designs, words or anything. You can glue on beads, or any type of bling or even fabric. OR you could paint it and then decoupage pictures or words or add bling. I really encourage everyone to make a belly cast if possible. There is nothing more beautiful than a pregnant belly full of life! If you are shy you can do it with your husband in the privacy of your home and it can be a private memento just for you. Or you can proudly display it as the beautiful, miraculous work of art that it is!! 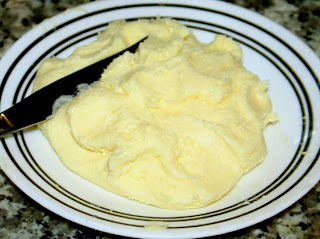 I know when you think about homemade butter you envision someone sitting on their front porch on a hot summer day, big butter churn, in dress and bonnet, just churning away for hours only stopping to wipe the sweat off of her brow. OK people it is totally is NOT like that. It is actually pretty easy and quick. There are several ways you can make butter. Mostly you just need to agitate the cream. 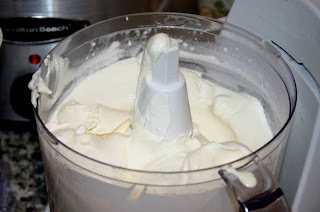 For kids it is fun to put it in a jar with some marbles and let them shake and shake (maybe I'll post about that later) but the easiest way I have found is to use a food processor or something similar that will agitate the cream really fast. I use one of those large processors/choppers. the blade at the bottom works fine to move it all really fast. 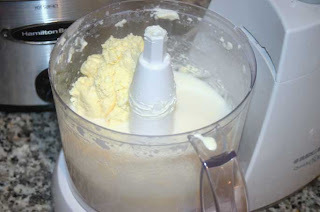 I have used the little handy chopper when I had just a small amount of cream and only needed a little butter, but I am sure you could use a stand mixer or stick mixer or even beaters if that is all you have. Start with cream. 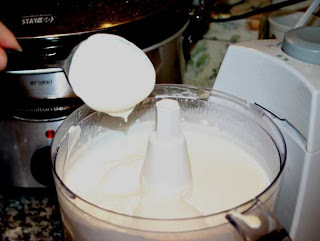 Raw cream is ideal but heavy cream that you buy at the store will work too. It works quicker if the cream is room temp. With our raw cream I will sometimes leave it out overnight (raw cream sours, it doesn't spoil). Letting it get a little sour makes for better butter. 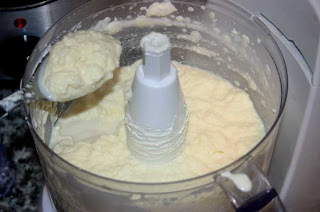 I am sure you can let store bought cream sit out too, but not too long (don't want it going rancid). You can use cold cream from the fridge too, I have when I didn't plan ahead it just takes a bit longer. 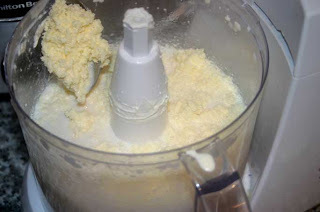 Using a food processor, I can usually get butter in 3-6min. This day I used 4 cups of cream (and got 1 cup of butter). It had been in the fridge for a couple weeks, so was already a tad sour but was also very thick on top (the longer it sits, the thicker it gets on top, a bit thinner on the bottom). Pour it in your food processor etc. and turn it on. The processor will churn your cream into butter. Normally I just let it run till I have butter, but I have stopped mine to take pictures to show you the changes it goes through. The first few times you make it you are sure to stop it several times to check anyway, until you get a hang of what it looks/sounds like when it gets to the butter stage. 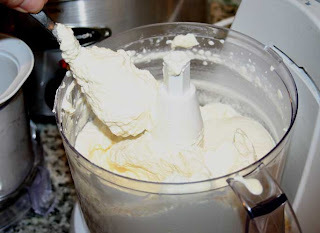 Within a minute or 2, your cream will start to thicken and eventually you will make whipped cream. I have a nice thick cream above, and below shows a pretty good whipped cream. But you have to keep going. 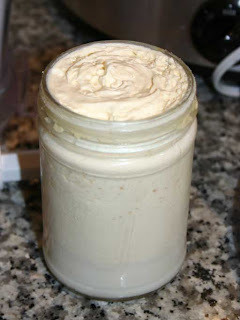 As you keep churning it will continue to get more texture to it, looking almost grainy, but still thick. The picture below would be a very buttery flavored whipped cream. As it gets closer to turning into butter, it will "appear" to thin out some, as the buttermilk is starting to separate out. 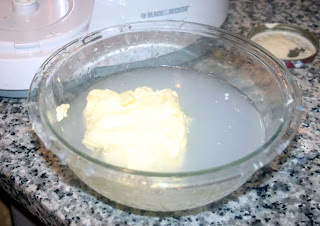 You can see below that it is watery, with some thicker globs, but it isn't quite finished butter yet, almost. 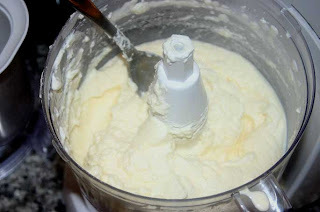 Notice all the thin white buttermilk, with the thick globs of yellow butter completely separated out. Here I have taken a spoon and pushed all the butter to the side so you can see how it has separated from the buttermilk. There are a couple ways you can tell if your butter is finished, other than stopping the machine and pulling the top off to check. Another clue is how it sounds, when it gets to the butter stage, because of the change in texture, the machine will make a different sound than it did before. If you are listening, you can hear it. Once you have butter, you will need to strain out your buttermilk. 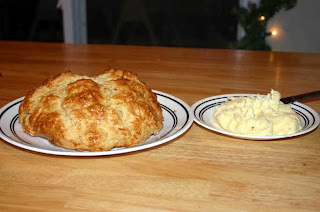 I usually just push all the butter to one side and pour the buttermilk into a jar to refrigerate and use for whatever. This is not the same as buttermilk you buy in a store, that is cultured buttermilk. The next step is to wash the butter. 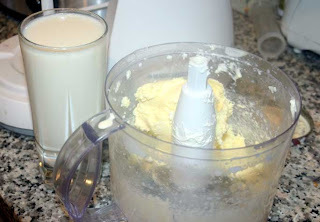 You want to get as much buttermilk out of the butter as possible or it will spoil really quick. I typically work it around in the bowl, replacing the water with fresh water till all the water is clear. You need to use cold water. If the water isn't cold the butter will be mushy and sticky. 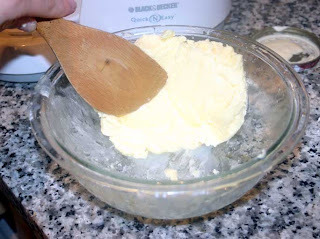 Lately I have just been using my hands and working it that way (cold butter can be handled easily). I'll keep the bowl in the sink and keep a stream of water running into it till it is all rinsed. Once all the water runs clean and I am pretty sure I have all the buttermilk out, I then work the remaining water out of the butter (below). You can press it over and over against the side of a bowl, working it around and around till all the water is out. If it is nice and cold and firm I will sometimes blot it in a cloth or something too. After it is rinsed you can add salt (I usually knead it in by hand) and any flavors (honey for honey butter etc.). To store, I usually just put it in a glass bowl with a lid but you can roll it in was paper or put it in molds in the fridge or whatever. I have found it will usually keep for a week or 2. But you can put it in the freezer and it will keep longer. It is very hard so you can let it sit out a bit if you want it spreadable. I like to use it immediately after I make it. It is VERY yummy!! The night I made this butter Charlie had made some soup and bread!!! We live up on top of a mountain. It isn't a huge mountain, around 2500 ft. It is a pretty good climb up a narrow windy road though (which the neighborhood paves in the snow thank goodness!!). We don't have a view from our house, we have 1 1/2 acres of completely flat land . 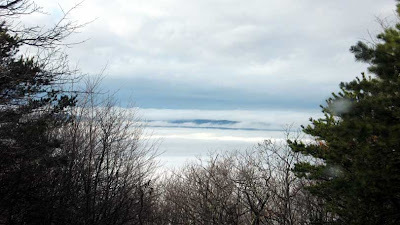 . . it is totally flat at the very top, running the length of the mountain ridge. But we have some great views driving up and down (and would have views across the street if someone were to buy those lots and clear them to build houses . . . I'd rather have the privacy though). Oh we do have somewhat of a view from the middle of the field. 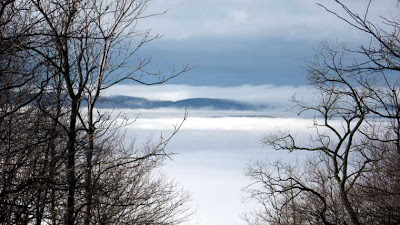 We are usually covered in fog up here when it is rainy, but on this particular day in mid Dec we were very clear, it was just a bit misty. 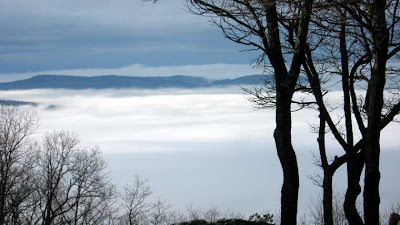 The fog was below us. Charlie loves taking 'nature' photos, so he drove down the road and shot these with his little work camera. There is a mountain range on the other side. Normally you would see land or houses etc. down there where the fog is. I thought it was gorgeous, looks almost like the sea. Add to that him also having a pretty bad cold and ear infection (a first for any of my 5 kids) and us preparing for the holidays (you know all the stuff I had to make) and it equals a whole lot of craziness!! I saw these online and I fell in love with them!! Too cute! 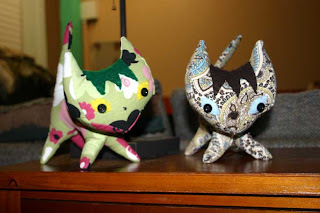 I call them Kozy Kitties because they were made with scrap Kozy fabric and, well, the pictures of them were taken at Kozy! 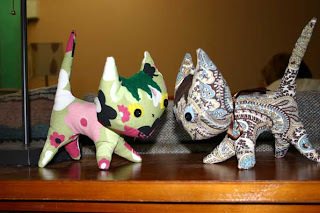 I think I am going to make a Kozy mascot out of our most popular Windy Day print (we have some scraps here I can use). The one on the left was for my niece Elise (Charlies brothers baby girl who is 6 wks younger than Thrace) and the one on the right was for Piper because she loves kitties. 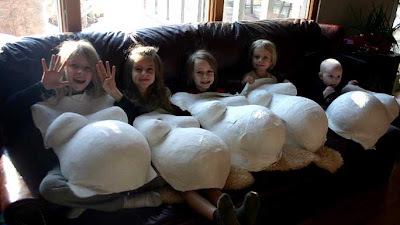 Of course now all the kids want one and I am sure to make a bunch (without complaining) because they are just too durn cute! We had our annual family new years party at Kozy this year. The whole fam on my side (parents, sisters, 14 grandkids) all go to the Kozy headquarters and have a party, food etc. and then we spend the night. The kids have a ball. They bring their newest gifts (this year we had lots of scooters, and RC cars . . . last year it was skate shoes and video games). We usually pitch tents or get out the air matresses. My sister and her husband had just come back from a few days at the beach so they had their camper and my dad insisted that they just back it on in the bay door (cargo dock or whatever it is) and so they did! Crazy no? Needless to say they slept pretty comfy in there! And we have a huge place here, so the kids still had plenty of room to skate around and play and stuff (we could probably fit 8 of those campers in here!). I am having camera issues (meaning that my battery charger died and I can't afford a new one right now so I am conserving power) so I didn't take as many pictures this year. Esther is 6mo, Jackson (kristi's baby) is 3mo and Thrace just turned 7mo. I have eaten WAY too much junk since Thanksgiving. It seems to take me a month longer after each baby for my body to get back to normal. I can fit into all my clothes well before then but I was just starting to finally look like my old self at around the 6mo point. However I think I have regressed with all the eating in the last month, LOL!! Time to either cut back or break down and exercise (I know, I know, I should do it anyway for my overall health!). I guess now is as good a time as any to start huh?